› Author AffiliationsFunding: This work has been supported by German Federal Ministry of Education and Research (Grant No’s. 01ZZ1609A, 01ZZ1609B, 01ZZ1609C, 01ZZ1803A, 01ZZ1803B, 01ZZ1803C, 01ZZ1803D, 01ZZ1803E, 01ZZ1803F, 01ZZ1803G, 01ZZ1803H, 01ZZ1803I, 01ZZ1803J, 01ZZ1803K, 01ZZ1803L, 01ZZ1803M, 01ZZ1803N). Introduction: This article is part of the Focus Theme of Methods of Information in Medicine on the German Medical Informatics Initiative. 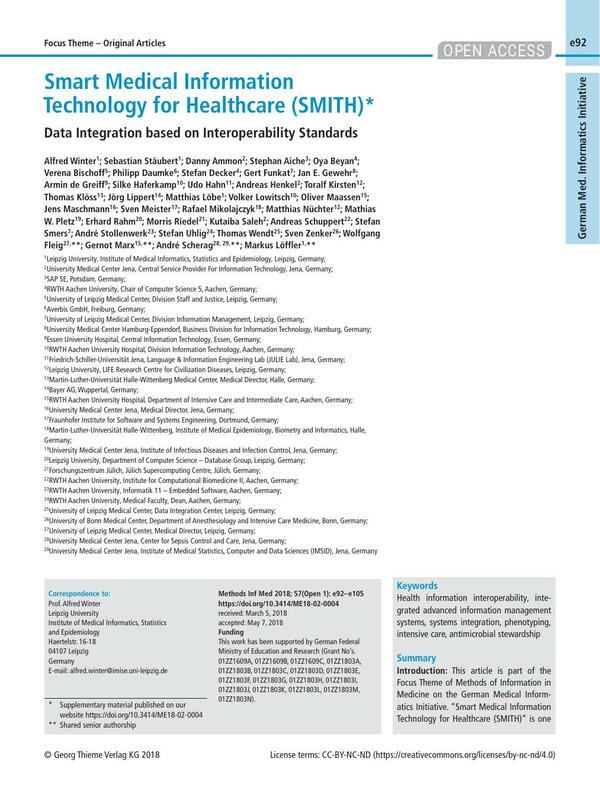 “Smart Medical Information Technology for Healthcare (SMITH)” is one of four consortia funded by the German Medical Informatics Initiative (MI-I) to create an alliance of universities, university hospitals, research institutions and IT companies. SMITH’s goals are to establish Data Integration Centers (DICs) at each SMITH partner hospital and to implement use cases which demonstrate the usefulness of the approach. Objectives: To give insight into architectural design issues underlying SMITH data integration and to introduce the use cases to be implemented. Governance and Policies: SMITH implements a federated approach as well for its governance structure as for its information system architecture. SMITH has designed a generic concept for its data integration centers. They share identical services and functionalities to take best advantage of the interoperability architectures and of the data use and access process planned. The DICs provide access to the local hospitals’ Electronic Medical Records (EMR). This is based on data trustee and privacy management services. DIC staff will curate and amend EMR data in the Health Data Storage. Methodology and Architectural Framework: To share medical and research data, SMITH’s information system is based on communication and storage standards. We use the Reference Model of the Open Archival Information System and will consistently implement profiles of Integrating the Health Care Enterprise (IHE) and Health Level Seven (HL7) standards. Standard terminologies will be applied. The SMITH Market Place will be used for devising agreements on data access and distribution. 3LGM2 for enterprise architecture modeling supports a consistent development process. The DIC reference architecture determines the services, applications and the standards-based communication links needed for efficiently supporting the ingesting, data nourishing, trustee, privacy management and data transfer tasks of the SMITH DICs. The reference architecture is adopted at the local sites. Data sharing services and the market place enable interoperability. Use Cases: The methodological use case “Phenotype Pipeline” (PheP) constructs algorithms for annotations and analyses of patient-related phenotypes according to classification rules or statistical models based on structured data. Unstructured textual data will be subject to natural language processing to permit integration into the phenotyping algorithms. The clinical use case “Algorithmic Surveillance of ICU Patients” (ASIC) focusses on patients in Intensive Care Units (ICU) with the acute respiratory distress syndrome (ARDS). A model-based decision-support system will give advice for mechanical ventilation. The clinical use case HELP develops a “hospital-wide electronic medical record-based computerized decision support system to improve outcomes of patients with blood-stream infections” (HELP). ASIC and HELP use the PheP. The clinical benefit of the use cases ASIC and HELP will be demonstrated in a change of care clinical trial based on a step wedge design. Discussion: SMITH’s strength is the modular, reusable IT architecture based on interoperability standards, the integration of the hospitals’ information management departments and the public-private partnership. The project aims at sustainability beyond the first 4-year funding period. 3 Kirsten T, Kiel A, Wagner J, Rühle M, Löffler M. Selecting, Packaging, and Granting Access for Sharing Study Data. In: Eibl M, Gaedke M. editors. Informatik 2017 – Bände I-III: Tagung vom 25.-29. September 2017 in Chemnitz. Bonn: Gesellschaft für Informatik; 2017: 1381-1392 (GI-Edition Proceedings; vol. 275). 4 Kirsten T, Kiel A, Rühle M, Wagner J. Metadata Management for Data Integration in Medical Sciences – Experiences from the LIFE Study. In: Mitschang B, Ritter N, Schwarz H, Klettke M, Thor A, Kopp O, et al. editors. BTW 2017: Daten-banksysteme für Business, Technologie und Web (Workshopband); Tagung vom 6. – 7.März 2017 in Stuttgart. Bonn: Gesellschaft für Informatik; 2017: 175-194 (GI-Edition – lecture notes in informatics (LNI) Proceedings; volume P-266). 5 Loeffler M, Engel C, Ahnert P, Alfermann D, Arelin K, Baber R. et al. The LIFE-Adult-Study: Objectives and design of a population-based cohort study with 10,000 deeply phenotyped adults in Germany. BMC Public Health 2015; 15: 691. 7 Winter A, Brigl B, Wendt T. Modeling Hospital Information Systems (Part 1): The Revised Three Layer Graph-Based Meta Model 3LGM2. Methods Inf Med 2003; 42 (05) 544-551. 9 Staemmler M. Towards sustainable e-health networks: does modeling support efficient management and operation?. In: Kuhn KA, Warren JR, Leong T-Y. editors. Proceedings of Medinfo 2007 (Part 1). Amsterdam: IOS Press; 2007: 53-57 (Stud Health Technol Inform; vol. 129). 10 Stäubert S, Winter A, Speer R, Loffler M. Designing a Concept for an IT-Infrastructure for an Integrated Research and Treatment Center. In: Safran C, Marin H, Reti S. editors. MEDINFO 2010 Partnerships for Effective eHealth Solutions. Amsterdam: IOS Press; 2010: 1319-1323 (Stud Health Technol Inform; vol. 160). 13 Stäubert S, Schaaf M, Jahn F, Brandner R, Winter A. Modeling Interoperable Information Systems with 3LGM2 and IHE. Methods Inf Med 2015; 54 (05) 398-405. 16 Juhr M, Haux R, Suzuki T, Takabayashi K. Overview of recent trans-institutional health network projects in Japan and Germany. J Med Syst 2015; 39 (05) 234. 17 International Organization for Standardization (ISO). ISO 18308: 2011 Requirements for an electronic health record architecture. 2011 [cited 2014 Jan 23]. 19 Hellrich J, Matthies F, Faessler E, Hahn U. Sharing models and tools for processing German clinical texts. Stud Health Technol Inform 2015; 210: 734-738. 20 Marincola FM. Translational Medicine: A two-way road. J Transl Med 2003; 01 (01) 1. 24 Wilkinson MD, Dumontier M, Aalbersberg IJJ, Appleton G, Axton M, Baak A. et al. The FAIR Guiding Principles for scientific data management and stewardship. Sci Data 2016; 03: 160018. 25 Darmoni SJ, Thirion B, Leroy JP, Douyère M. The use of Dublin Core metadata in a structured health resource guide on the internet. Bull Med Libr Assoc 2001; 89 (03) 297-301. 26 Meineke Frank, Stäubert S, Löbe M, Winter A. A Comprehensive Clinical Research Database based on CDISC ODM and i2b2. Stud Health Technol Inform 2014; 205: 1115-1119. 27 Murphy SN, Mendis M, Hackett K, Kuttan R, Pan W, Phillips LC. et al. Architecture of the open-source clinical research chart from Informatics for Integrating Biology and the Bedside. AMIA Annu Symp Proc 2007; 2007: 548-552. 28 Hripcsak G, Duke JD, Shah NH, Reich CG, Huser V, Schuemie MJ. et al. Observational Health Data Sciences and Informatics (OHDSI): Opportunities for Observational Researchers. Stud Health Technol Inform 2015; 216: 574-578. 29 Kho AN, Cashy JP, Jackson KL, Pah AR, Goel S, Boehnke J. et al. Design and implementation of a privacy preserving electronic health record linkage tool in Chicago. J Am Med Inform Assoc 2015; 22 (05) 1072-1080. 31 Löbe M, Ganslandt T, Lotzmann L, Mate S, Christoph J, Baum B. et al. Simplified Deployment of Health Informatics Applications by Providing Docker Images. Stud Health Technol Inform 2016; 228: 643-647. 32 Richesson RL, Smerek MM, Blake CCameron. A Framework to Support the Sharing and Reuse of Computable Phenotype Definitions Across Health Care Delivery and Clinical Research Applications. EGEMS (Wash DC) 2016; 04 (03) 1232. 33 Hahn U, Matthies F, Lohr C, Löffler M. 3000PA—Backbone for a national clinical reference corpus of German. MIE 2018. In: Ugon A, Karlsson D, Klein GO, Moen A. editors. Building Continents of Knowledge in Oceans of Data: The future of co-created e-health. Amsterdam: IOS Press; 2018: 26-30. 34 Hahn U, Matthies F, Faessler E, Hellrich J. UIMA-based JCoRe 2.0 goes GitHub and Maven Central: State-of-the-art software resource engineering and distribution of NLP pipelines. In: Calzolari N. editor. LREC 2016: [proceedings]. [S. l.: s. n.]; 2016: 2502-2509. 35 Henry KE, Hager DN, Pronovost PJ, Saria S. A targeted real-time early warning score (TREWScore) for septic shock. Sci Transl Med 2015; 07 (299) 299ra122. 36 Wolkenhauer O, Auffray C, Brass O, Clairambault J, Deutsch A, Drasdo D. et al. Enabling multiscale modeling in systems medicine. Genome Med 2014; 06 (03) 21. 37 de With K, Allerberger F, Amann S, Apfalter P, Brodt H-R, Eckmanns T. et al. Strategies to enhance rational use of antibiotics in hospital: A guideline by the German Society for Infectious Diseases. Infection 2016; 44 (03) 395-439. 38 Vogel M, Schmitz RPH, Hagel S, Pletz MW, Gagelmann N, Scherag A. et al. Infectious disease consultation for Staphylococcus aureus bacteremia – A systematic review and meta-analysis. J Infect 2016; 72 (01) 19-28. 39 DeLisle S, South B, Anthony JA, Kalp E, Gundlapallli A, Curriero FC. et al. Combining free text and structured electronic medical record entries to detect acute respiratory infections. PLoS One 2010; 05 (10) e13377.